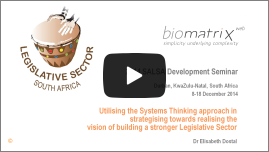 Speech given by Dr Dostal at the Secretaries’ Association of the Legislatures of South Africa (SALSA) Development Seminar in Durban in December 2014: Utilising the systems thinking approach in strategising towards realising the vision of building a stronger legislative sector. 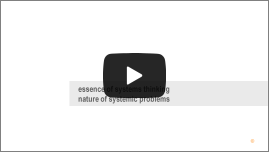 Dr Dostal gives an overview of the talk, outlines the development of Biomatrix systems theory (a meta-systems theory) and discusses the importance of systems thinking as the worldview of the information age. Dr Dostal discusses some of the key concepts of systems thinking (co-production, emergence, impact) and their implication for change management. She also gives an overview of the steps in systemic change management. Dr Dostal outlines the difference between the two types of systems within the biomatrix and discusses the activity systems in more detail. Sustainable management of supply chains is explained on the case study of German Energiewende and the electricity supply chain. Dr Dostal points out the deficiencies of the current function specific governance structure, stresses the multi-dimensionality of each dimension of development and the importance of transversal ideal system design. She also outlines the principles of stakeholder governance.